Alexandria Ocasio-Cortez in conversation. Photo Credit: Jose A. Alvarado Jr. The almost sudden rise of Alexandria Ocasio-Cortez is one of the more intriguing things about American politics right now. She has become an almost sparkling new standard bearer for variously labelled radical, progressive, or just left Democrats (and even some “Wall Street liberals”! ), energized by the 2018 midterm elections and the ongoing foibles of the Trump Republicans — and their reckless “populist conservative” leader. Ms Ocasio-Cortez is also known by her three initials AOC. (And if this reminds you of FDR and JFK, or even LBJ, that could be the intention.) In just a few words, she is the unquestionably charismatic new House of Representatives member for the eastern Bronx and north-central Queens in New York City (aka congressional district NY–14). A few weeks ago a group of FOX News commentators were nervously discussing the prospect that Alexandria Ocasio-Cortez might even become the Democrats’ presidential nominee for 2020. They forgot that at 29 AOC is “the youngest woman ever to serve in the United States Congress” — and fails to meet the minimum age of 35 for presidents under the US Constitution. 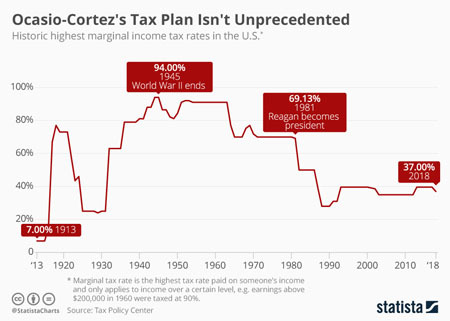 If Ms Ocasio-Cortez cannot run for president in 2020, however, her policy ideas can still wield considerable weight and heft. 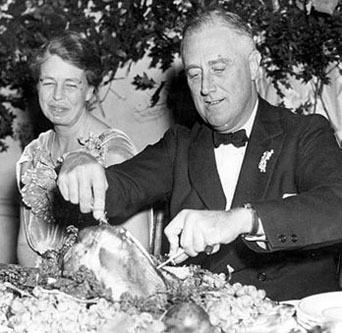 Franklin Delano Roosevelt (FDR) carves Thanksgiving turkey as his especially progressive activist wife Eleanor looks on. 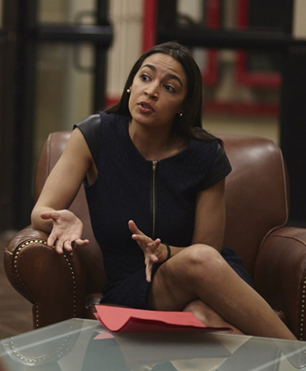 AOC’s policy ideas have also come in for much criticism. 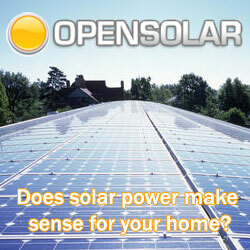 The first concept in the seven-point program summarized by Michael Moore has attracted the most attention. 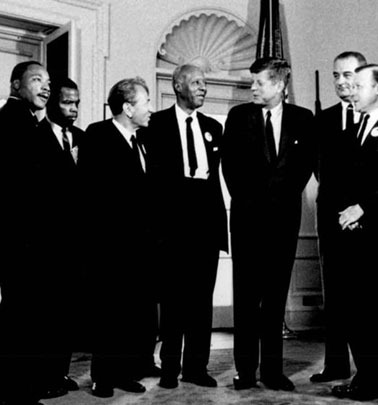 JFK, LBJ, MLK Jr and friends at the White House. 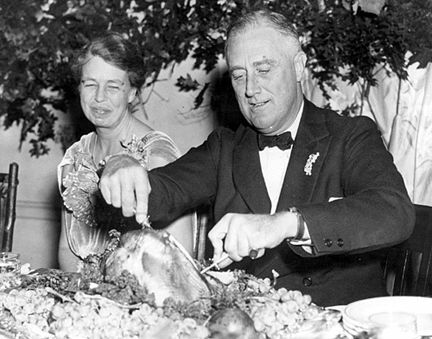 Those of us who grew up immediately after the Second World War, in the late 1940s, 1950s, and 1960s, can still remember how the world of FDR, JFK, and LBJ (and Harry Truman and General Dwight Eisenhower) was in some ways more progressive and democratic than what followed the right-wing revolutions of the 1970s and 1980s — which have led us to where we are today. It is at the very least interesting to see a 29-year old woman trying to revive something of this earlier American progressive legacy for the 21st century. At the same time, it is of course all too easy to be sceptical about all such things, in a world still so profoundly influenced by the narrow self-interests of Davos billionaires. 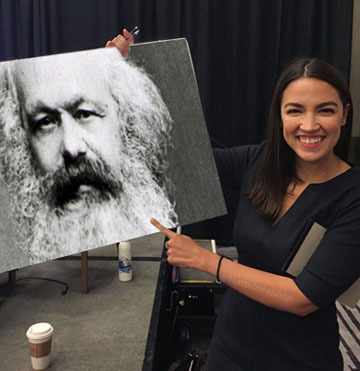 AOC with photo of former columnist for Horace Greeley’s New York Tribune. Something similar is no doubt afoot in the USA today as well. And Alexandria Ocasio-Cortez is speaking right into its deepest heart. Which may finally somehow prove more relevant than Howard Schultz and Michael Dell and all their colleagues can easily understand. Meanwhile, AOC is at least making American politics more democratic (and Democratic) — and more entertaining too!